Hi there. I’m trying to trace wood backing plates for clear positions on my Boston Whaler boat refit [on a hull initially identified as a 1994 Outrage 22 but later possibly identified as a 1994 21 Outrage but having an appearance that does not match the Boston Whaler documentation]. 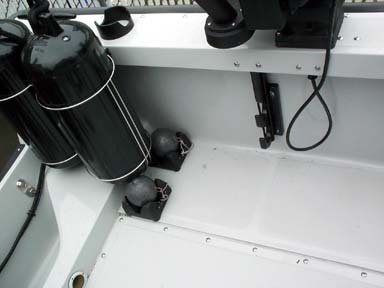 The cleats were previously mounted on deck, and I have noticed that a lot of Boston Whaler boats have them mounted on the [inwhale] under the gunwale. [Seeks] any information on [the location of cleats and the location of wood backing plates]. I have researched the usual websites, and all the drawings of my boat [have] been removed. I presume you mean a 1994 Outrage 21 since there was only a Outrage 21 and Outrage 24 model that year. 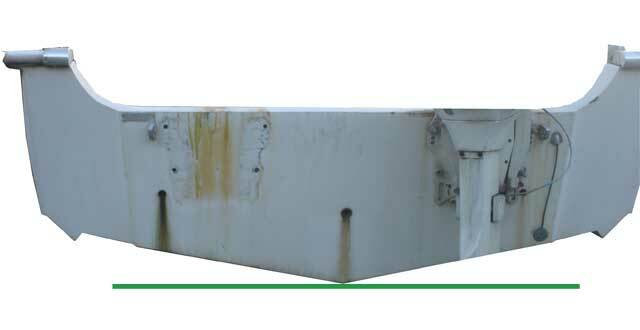 Here is a photo from the catalog showing the stern of the Outrage 21. I see the cleats on the top of the cap. If there is no wood, you should add aluminum backing plates. They should be through bolted. On classic Boston Whaler Outrage 22 notched transom boats in production in the 1980’s and into c.1992, the stern cleats are mounted to the inwhale, and a hawsepipe on the gunwale allows mooring lines to be lead to the cleats. Distinguishing between a classic Outrage 22 boat and a c.1994 Outrage 21 ought to be able to be done based on more than just the location of the stern cleats. W--if the boat is actually a 1994, I think,based on the splashwell design and the lifting eye, you may have a Guardian 22. It was a commercial-military version based on the Outrage 22 and was in production long after the recreational version ceased to be produced. In the images above a lifting eye seems to appear on the hull, forward from the stern cleat and just aft of the rail base. A lifting eye would be appropriate on a military-use hull. The lifting eye looks like rather fancy stainless steel, appropriate for a yacht. Show us a wider view of the hull to aid identification. That boat looks more like a classic Outrage V-20 hull, and not a 22-foot hull. There are many pictures of the V-20. --the gunwale cap where the cleats are currently located consists of fiberglass mat with encapsulated plywood to serve as a backing material. --the gunwale cap is screwed down to the gunnel and/or L brackets are used. The classic Outrage 18 noats that have cleats mounted to the topside have backing material in that location. I don't know if that backing material is present in your hull. Without it, adding a cleat would not be recommended. What is the reasoning for moving the existing cleats? Hi there. Just to enquire about my previous thread. I have been trying to trace what Outrage I have. I was informed by the people on here that my boat was not a Outrage 22. However I noticed a Outrage 22 in Italy today. I checked the serial number at the boat was launched in 1992, one year before mine. Could it be that mine is a 22? The key items that make a boat a V-22 is the angle of the keel at the transom. It is a shallow or wide V.
In a V-22, The bow steps are added on and have storage area. In a Outrage 22 the keel V is steeper and the bow steps are part of the mould and do not have storage areas. Your photos show the hull to be an Outrage 22 hull. It may not have all the features of the standard Outrage 22. Also note, international sales had different options/engines that were dealer and country specific. Boston Whaler's Commercial Products Division(CPD) sold recreational hulls with modifications as a commercial model. Once the recreation version ceased production, the mold was transferred to CPD who continued to produce and sell the commercial model for many more years. It is possible your boat is a Guardian 22. I would leave the cleats as they are. Since you can SEE your own boat and you can see the OUTRAGE V-20 boat images in the REFERENCE section article I wrote and gave you a hyperlink, it should be easy for you to deduce if the boat you have is a V-20 or an OUTRAGE 22. Also, you can measure the length of the hull of your boat, and this dimension will give clear evidence about the model. The more recently posted images show that lockers in the bow appear to be molded into the hull. That disqualifies the V-20 as a possible model for this hull. Most OUTRAGE 22 hulls had a narrow sink-type splashwell. Only OUTRAGE 22 boats molded after c.1990 have the full width engine splashwell. In one of the images above the engine splashwell seems to be somewhat different, not quite like either OUTRAGE 22 splashwells. The rectangular deck opening plates in the aft cockpit are not typical of an OUTRAGE 22. 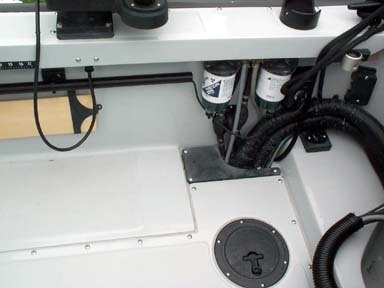 The large metal deck plate hatch forward of the center console is typical of a GUARDIAN 22. Phil's deduction that the boat may have been ordered as a GUARDIAN 22 or some variant from the Boston Whaler Commercial and Government Products division is likely correct. It should be a simple matter to find the hull identification number (HIN) and see the manufacturer identity code (MIC). If the MIC is WCG this will identify the boat as a commercial hull. For help with interpretation of the HIN see the lengthy and detailed explanation of the HIN in the FAQ. Due to the similarity of the engine splashwell in the boat under discussion and the GUARDIAN 22 boat shown in the CETACEA pages, I am now quite sure the boat under discussion is a GUARDIAN 22 or some similar variant ordered from Boston Whaler Commercial and Government Products, and not an OUTRAGE 22, an OUTRAGE 21, or an OUTRAGE V-20 as mentioned in earlier speculation in this discussion. [What is] the difference between the Guardian 22 and the Outrage 22? Is just a commercial vessel? On another note the deck has delaminated and I'm replacing the deck. I'm not going to have the BOWMAR watertight hatch. I will have a locker instead. Also I'm going to have a aft locker. [I want to see] photos of deck layouts of OUTRAGE 22 and the GUARDIAN 22. Willie B wrote: [What is] the difference between the Guardian 22 and the Outrage 22? Boston Whaler boats made for commercial, government, or work-boat use generally have hull laminates with thicker fiberglass layers, have internal reinforcements made from aluminum, and have deck access hatches that are more rugged, heavier, and gasketed to be watertight, such as the large BOWMAR hatch you mention on your boat. As a result the dry hull weight will typically be greater than a similar hull made for recreational boat use. The rub rails on these boats are often substantially different from the rub rails used on recreational boats with similar hull designs. Willie B wrote: [I want to see] photos of deck layouts of OUTRAGE 22 and the GUARDIAN 22. Two photographs from those articles were already posted as in-line images in this thread, so I am surprised you have not already seen them. There are many more photographs in the CETACEA article that was mentioned earlier, and they show details of the deck very well. I encourage you to follow the earlier reply and its hyperlink to see those photographs. The purpose of including hyperlinked text to the articles that showed the GUARDIAN 22 was to make it simple for you to find that information. Just click on the hyperlinked text to see the information you desire. The CALLOUTS are identified in the Owner's Manual. Follow the link above to see them. To see more images of Boston Whaler OUTRAGE 22 boats from CONTINUOUSWAVE, try this search LINK. Use the IMAGES tab to see the image search results. You will find all the images of the Boston Whaler OUTRAGE 22 on this website. There are many images, and several show details of the deck and cockpit. Willie B wrote: ...the console is different, mine is more like a Outrage 22. I don't think one mold could make two different consoles. Each of the two different consoles probably has its own mold. 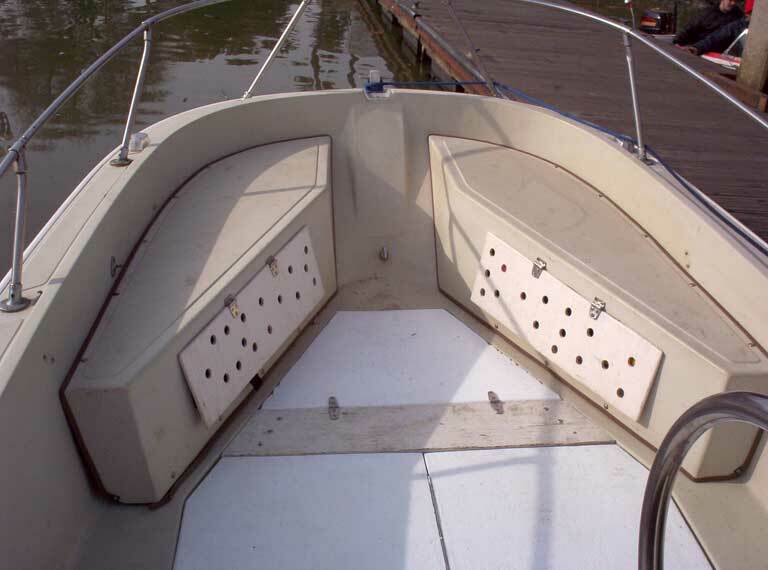 Generally the boats made for commercial user tend to use an aluminum welded center console, not a molded fiberglass console. I am surprised that if your boat was a GUARDIAN it came with a molded fiberglass console, at least that is the inference I made when you mentioned the word "moulds" in relationship to the console on your boat. Aluminum consoles are not made in molds, typically. They are made from aluminum panels, perhaps sometimes bent panels, and welded. In any case, it is difficult to know what the console on your boat looks like and how it is made for readers, like me, because you have not described it in detail or shown it to us, except with pictures that show the console completely covered with canvas. I doubt that the GUARDIAN and the OUTRAGE 22-foot hulls come from the same molds, but that is my speculation. Asking readers to answer this question is really asking people to speculate--none of us know the answer. The shape of the outer hull might be the same, but we can already see clearly that the inner hull liner is different on the two boats. Depending on when the GUARDIAN was made, there may have been a separate production facility involved, distinct from the Boston Whaler main plant in Everglades, Florida. Have you found a hull identification number or HIN on this boat we are discussing? Q2: Where is the Hull Identification Number? You really should follow these suggestions to more information and read them. If you want to get information from actual real sources of information about this boat, assuming it is a Boston Whaler boat and has a HIN indicating it was made by them, you have to find the HIN. Then you need to contact the company that made the boat, either Boston Whaler (recreational) or Boston Whaler Commercial and Government Products, and ask them if they use the same molds. I cannot imagine that anyone other than those two companies know if the same molds were used to mold both the OUTRAGE 22 and GUARDIAN 22 hulls, except, as I already pointed out, it looks like the liner mold is quite different so I would expect that the liner mold is probably not the same based on this visual observation. Your dealer gave you some wrong information. 5J = this is a 22-foot hull and can be an OUTRAGE, CUDDY, REVENGE, TEMPTATION, or GUARDIAN model. 94 = model-year designation was 1994. The color of the gel coat is not encoded in the HIN. You can generally easily identify the color of the gel coat by a close visual inspection of the gel coat and assessment of the hue by eye. The location of the plant that built the boat is not encoded in the HIN. Prior to c.1987, Boston Whaler had a plant in Rockland, Massachusetts. In c.1987 Boston Whaler acquired a boat building facility in Edgewater, Florida, and then built Boston Whaler boats in both locations. In c.1994 the entire Boston Whaler production operation was moved to Edgewater, Florida. This history can be interpreted to mean that a boat like the 22-foot hull under discussion could have been built in Rockland, Massachusetts in November, 1993. Since there is already visual evidence the boat was built as a GUARDIAN, there is a good probability it was built in Rockland, as I believe the commercial-boat assembly probably stayed in Rockland until the very end days of that plant's operation. The 22-foot hull production prefix starts at 5A and ends at 5J. This suggests that a boat with production sequence 5J242 was probably one of the last 22-foot hulls built under the BWC manufacturer identification. After c.2001 the hulls build by the commercial assembly division began to use a different MIC code, WCG.